Free M4A to MP3 Converter is as the name suggests a free wav to mp3 converter that can convert wav to mp3. It can also convert m4a to mp3, convert ogg to mp3 and convert aac to mp3. This Free M4A to MP3 Converter has a simple and clear interface, allowing you to drag and drop files. You specify the file size, shuffle and output bitrate. Audio tags are kept and many presets are available. Download this Free M4A to MP3 Converter today. Convert aac, m4a, ogg, wav to mp3, aac, m4a, wav free! Microsoft Windows 2000, XP, 2003, Vista, Windows 7 or newer, 10 Mb hard disk space. ...... You can convert many files at once using the batch mode. This Free M4A to MP3 Converter has a simple and clear interface, allowing you to drag and drop files right onto the user interface. 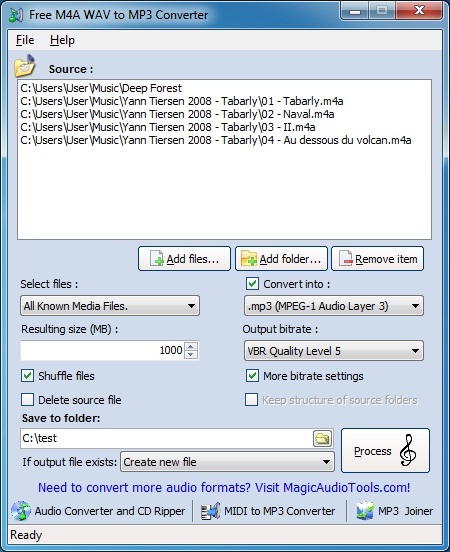 You can specify the size (MB) of the audio files to convert. In addition, you can choose whether you want the m4a to mp3 converter to shuffle the files or keep the structure of the source folders during the audio conversion. The mp3 to wav free converter keeps the audio tags of the songs you are converting and has a wide range of audio format presets so it is easy to set up and go. The output bitrates available in the aac to mp3 converter range from near CD quality all the way up to "Fast Extreme" or "Insane" levels. You pick a folder to save the new audio files in and also tell the free wav converter whether you want to create new files or overwrite existing files, if the files already exist. You should download this Free M4A to MP3 Converter and try it out today. Qweas is providing links to Free M4A to MP3 Converter 2.5.28 as a courtesy, and makes no representations regarding Free M4A to MP3 Converter or any other applications or any information related thereto. Any questions, complaints or claims regarding this application Free M4A to MP3 Converter 2.5.28 must be directed to the appropriate software vendor. You may click the publisher link of Free M4A to MP3 Converter on the top of this page to get more details about the vendor.